Background: Surface active agents are lower the surface tension of water and act as dispersants, foaming agent, wetting agent, emulsifiers etc. but after their use they discarded in water which cause major contaminants of water pollution now as days due to they are less biodegradable. These are harmful and can cause skin ingredient which lead to damage of body. Therefore it is necessary to find some methods to degrade them from environment. Objective: In the present investigation photocatalytic degradation has been applied for degradation of copper stearate surfactant derived from saturated fatty acid. Methods: Copper stearate was synthesize by reported methods and characterized by elemental analysis as well as IR, NMR, and Mass spectroscopic techniques. Results: The degradation was carried out by irradiating the non- aqueous solutions of copper stearate surfactant containing ZnO with UV. In this technique a semiconductor ZnO is used which is non -toxic in nature. The rate of reaction was estimated from residual concentration spectrophotometrically by measuring the absorbance of the reaction mixture at definite time intervals. 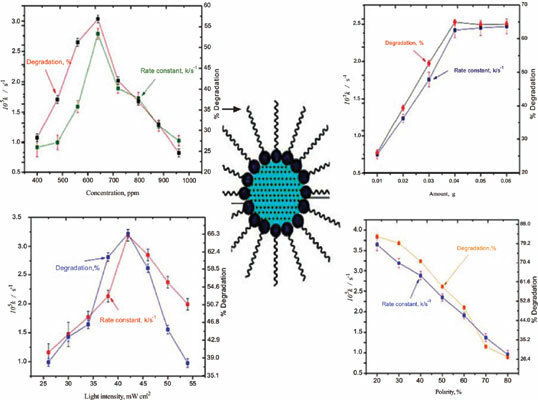 Different parameters such as the concentration of surfactant (400-960 ppm), amount of semiconductor (0.01-0.06 g), light intensity (26-54 mWcm-2), effect of solvent polarity (20- 80%) and time period for degradation (0-18 h) were varied to achieve the optimum rate of photo degradation. Conclusion: The observations revealed that copper stearate surfactant was degraded successfully by using ZnO under UV. A tentative mechanism has been proposed for the photo degradation of copper stearate surfactant. Keywords: Zinc oxide, photo catalytic degradation, semiconductor, copper stearate surfactants, surface active agents, dispersant. Keywords:Zinc oxide, photo catalytic degradation, semiconductor, copper stearate surfactants, surface active agents, dispersant. Abstract:Background: Surface active agents are lower the surface tension of water and act as dispersants, foaming agent, wetting agent, emulsifiers etc. but after their use they discarded in water which cause major contaminants of water pollution now as days due to they are less biodegradable. These are harmful and can cause skin ingredient which lead to damage of body. Therefore it is necessary to find some methods to degrade them from environment.